TSH: The consistent development and progression of the band is clearly evident with the recent tremendous album ‘Indigo Meadow’. What was the dynamic like heading into the studio for album number four? Alex: Well we are always happy to be in the studio creating. The mindset was crisp and dreamy. Like most we are always trying new things, so we turned our minds off and floated upstream. TSH: The album’s outcome truly is infectious – seemingly a more resolute, polished and refined sound. How do you feel the band’s latest album ties in with the evolution of the Black Angels sound? Alex: To us it’s just another chapter in the fairy tale that we all live. It was a snap shot of us in that moment. Moments later things changed and became blurry for us. TSH: It’s been mentioned that ‘Indigo Meadow’ was the most collaborative effort to date. Do you feel this adds a more comprehensive level of depth and accessibility? Alex: I’m not sure? It’s really hard to say, but that would make sense because we had more minds on the creation. So, it seems like it would appeal to more people. TSH: In terms of the album’s expression and narrative, themes such as politics, love, human connection, and acceptance are mentioned… As a whole what kind of message(s) do you feel underlines the album’s significance? Alex: I really feel like this album is how we looked at the world during that time. Cautious, scared, in love, tired, happy, paranoid, disappointed, but hopeful. I mean these are feelings that everyone has so it’s not like we are pioneering anything. I guess the underlying message ends with hope and that’s kind of a good feeling to go out on. TSH: In relation to instrumentation did you take on any particular different directions to allow for a more versatile result? Alex: Well we kinda go with the rule of whoever can play the part the best for the song. Some melodies were reinstated with different instruments until we found the one that fit. One second Stephanie is playing drums and the next second she is playing viola, next minute she is playing dominoes with Jesco W! TSH: Was the writing process constructed after jam sessions or written simultaneously with the music? Alex: Both of those methods are used, not one more than the other. TSH: What was it like having John Congleton board to nurture the sound? Alex: Great guy, awesome communicator. He has such a vast knowledge of music and is great at translating ideas into realities. Alex: Yeah! It was like a battle between Bland and Hunt to see who could get the most rare/best sounding fuzz pedals without going broke! TSH: What’s refreshing and great about the album is throughout many of the songs the vocal melodies take centre stage, which makes for an alluring result. Was there anything different about how you wanted the vocals to be conveyed for the album? Alex: Well we backed off the verb a bit here and there dove into different alchemy approaches. Stick the vocalist in a well; put the singer in a cage full of rabid chinchillas so on and so forth. TSH: Was ‘Indigo Meadow’ the natural choice as the album opener? Also, how did the inclusion of a flute from street a market in Morocco come to find its way into the song? Alex: It was actually John’s idea to open with it. He felt it was a new sound for us and wanted it first. The flute was just sitting there staring at us in the demo process and so we picked it up and blew air into it. The song just begged for flute so we gave the song what it wanted. It was the songs idea. TSH: Another top standout track from the album is ‘Holland’ with a great soothing tempo, alongside wonderful composition. What kind of motivations do you draw upon to craft such a distinct song? Alex: First off, thank you! It’s kinda difficult to describe what you are thinking while crafting a song. You are just pushing yourself and the song along until you feel it’s right. It is definitely different than anything we have written in the past so I suppose expanding the boundary was one motivation. I could say that about most of the songs on Indigo Meadow. TSH: I also wanted to get your views on the impetus behind the splendid ‘Love Me Forever’. Can you tell us how you go about layering and structuring such a progressive song? Alex: That one was one of those that just came together instantly. Bland started playing the riff, Steph started thumping on the drums and Kyle and I followed suit. It was one of the ones that, if I remember correctly, which I often do not was pretty true to its original form and feel from the first time we ever played it. I feel like Congo wanted us to change keys on the chorus at the end which implied a “Doorsy” feel and we went with it. TSH: What does the song ‘I Hear Colors (Chromaesthesia)’ mean to you personally? Alex: It’s about changing the way we interpret, digest, and communicate and relate to music. That song is blue, this one is black that other one over there is red, should we play a primary colour set? Should we play all red and black songs today? TSH: You’re currently readying the ‘Clear Lake Forest’ EP. What can fans expect from this offering? Alex: There are a few songs that we reworked from the previous recordings of Indigo and several new songs. Most of which have been rattling around in our minds for a while so we decided to set them free. It is an initial public offering. TSH: One of the songs made available from the EP entitled ‘Diamond Eyes’ takes on a laidback chilled and pleasant feel. In terms of tone and arrangements, what were you hoping for with the aim of this song? Alex: Damn I don’t really know…. I mean it is what it is, I know that’s not the answer you probably want, but it is a chilled out song. I like when bands jump from chill to frantic from song to song. That schizo thing is in everyone I believe. 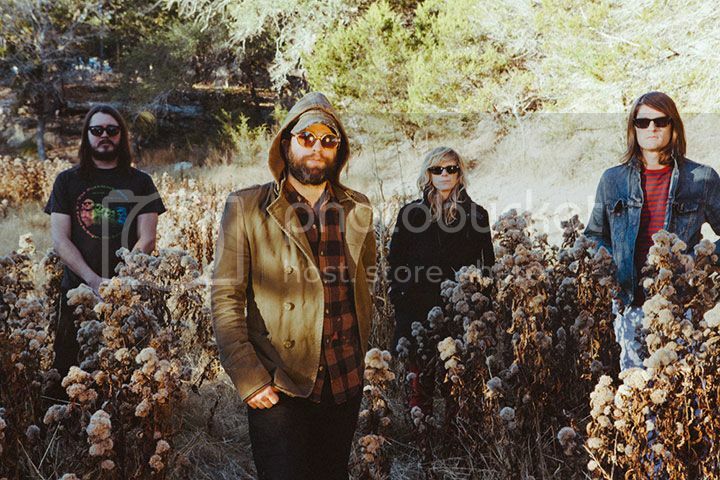 TSH: As a band it’s been mentioned The Black Angels have stated to ‘rethink your preconceived notions’. Do you find it important to encourage people to discover and find a satisfactory meaning in life for themselves? Alex: Yes, very important to the mental health in all peoples! TSH: Does living in Austin breed creativity and create drive in general? Alex: Yes and no. Yes because there is so much support and competition at the same time and no because there is just so much competition and support at the same time. Austin definitely feels to me like there is a growing fire of creativity that is expanding far beyond what I know. We may look back in 10 years and be surprised about what collectively came out of this city on all fronts not just art. TSH: Is the power of music the perfect form of escapism and release for The Black Angels? TSH: You guys have toured the US and Europe on quite a few occasions. What’s it like for the band to experience different cultures, traditions and ways of life from all over the world? Alex: As you may assume its very eye opening to see all the differences, but most importantly how similar we all are. We see archetypes of people we know all over the place. Walking down the streets of Munich, “oh there is the door guy from Mohawk’s twin”. TSH: The Black Angels are often commended for their prolific live performances which generate an amazing intense energy full of captivating skill sets from a band very much in form. Does playing live make you feel liberated? Alex: Yes, it is liberating, but also uncomfortable. When you can overcome that, which you have to do every time you become liberated. Conquering the fear and sharing music as a ritual is healing. TSH: Heading forward what kind of exploration do The Black Angels crave? TSH: When The Black Angels are not crafting or creating music how do they like to unwind? Alex: Like many Americans we like to unwind by studying various types of insects and compare morphology to our own bodies, the bodies of our musical instruments and tally the similarities. With those we generate hypotheses to find the meaning of life, it’s relaxing and soothing. It’s hot!